Roof cargo boxes are an incredibly popular item that can help you carry more luggage with you on a trip. People make use of these roof cargo boxes for many different things. It can help those who are going on a camping trip to transport the proper supplies. It will also work nicely to allow you to take more luggage on a trip when you do not have enough space in the car. It is easy to see how useful these roof cargo boxes are, but many people wind up wondering, “can a roof cargo box overhang?” The answer is that it really depends on how much overhang you are talking about. There are many different factors to consider and you want to make sure that you are doing things right. Take a look at all of the information that you can before purchasing your new roof cargo box, as it will ensure that you have the optimal experience moving forward. If you have been wondering, “can a roof cargo box overhang?” then you should set your mind at ease. The first thing that you should note is that having a little bit of overhang is going to be fine. You should try to keep things within reason, though. Too much overhang can create some stability issues while you are driving down the road. You want to be able to get to where you are going without any incidents, so it makes sense to be careful about how the roof cargo box is sitting. Most models of roof cargo boxes will have a little bit of overhang. This is going to be a normal situation that should not concern you too much. Just make sure that everything fits right and that it seems stable while you are driving. It may even be worth doing a test drive around your neighborhood to ensure that everything is good to go. You know that a little bit of overhang is fine, but you should also think twice about rear overhang. In some situations, a bit of rear overhang is going to be perfectly acceptable. The problem is that many of the vehicles that people use with these roof cargo boxes have rear hatches of some kind. If your roof cargo box has any type of rear overhang, then this can obstruct the rear hatch and will prevent you from easily being able to open things up. This is why it is always going to be recommended to situate the roof cargo box toward the front of your vehicle, rather than the rear. Of course, your situation may be different depending on your type of vehicle. If you are using a vehicle without a rear hatch, then a little bit of rear overhang is not going to be bad. Just follow the normal common sense rules of determining stability and making sure that the roof cargo box is of an appropriate size for your vehicle. The size of your roof cargo box is really going to matter, so you have to pay attention to this. If you want your trip to go as easily as it possibly can, then you should buy a cargo box that will work for you. If your roof racks are too small and you try to buy the largest roof cargo box on the market, then you are going to have a bad time. This is going to be an accident waiting to happen and you should do your best to avoid it. You have to keep things within reason when you are using a roof cargo box. 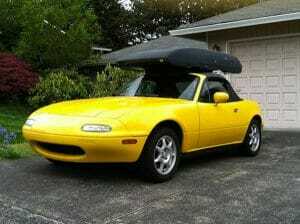 If you have smaller roof rack rails, then it is best to stick to a modest roof cargo box. You can, sometimes, use a larger box than usual, but you will want to prepare things properly ahead of time. Do not buy a roof cargo box that is way too big for your vehicle if you want to have a good experience while out on the road. It will simply give you headaches and you will wind up regretting the experience. Be sure to take a look at our Roof Box size guide. Stability is very important for your roof cargo box. If the cargo box is not stable, then it will run the risk of falling off or causing other types of problems. This would be a huge fiasco if it were to occur while you were driving down the road, so it should be avoided at all costs. You want to take the extra time to ensure that your roof cargo box is completely stable. As long as you use the right size cargo box for your vehicle, everything should be fine. If you want to use a wider roof cargo box, then you will want to ensure that you are using a wide spread bar. It can help to provide that extra stability that you need so that everything will work out nicely. Take your time to test the overall stability of your roof cargo box ahead of your trip. This will give you the confidence that you need and you will have the most pleasant drive possible to wherever your destination happens to be. As long as you make proper use of the advice above, you will have a good experience with your roof cargo box. Can a roof cargo box overhang? It certainly can, as long as you make sure that you take the proper precautions. It is going to be good to make sure that you buy a roof cargo box that is the right size for your vehicle, and other factors need to be considered as well. If you do plan on using a larger box with a bit more overhang than usual, then it is smart to use a wider bar spread. You just want to ensure that everything is as stable as possible so that you will not run into any problems while on the road. As long as you are mindful of what you are doing, it should turn out fine. You will have a smooth time while you are driving and your new roof cargo box will simply make your trip more convenient.